Kaia Personal Trainer uses patent-pending AI-powered motion tracking technology, without the need for additional hardware, transforming your iPhone into a virtual personal trainer and helping you achieve correct exercise execution. •	Get real-time audio feedback on your exercise performance. •	Automatically counts the number of correct repetitions. •	You are greeted by Kaia, the apps’ virtual personal trainer who guides you through the exercises. •	Place your iPhone upright on a table or against a wall, then step back approximately 7 feet until your body becomes visible on the phone’s screen. •	The app then tracks 16 key points on the body using the phone’s camera. •	This contrasts your observed pose with the ‘ideal’ predefined pose and compares metrics including the relative positions of limbs and joints, and the angles between them. 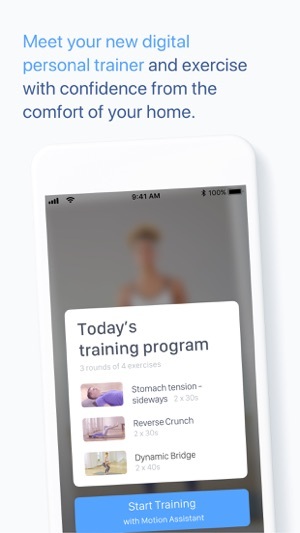 •	During the exercise, Kaia offers actionable, real-time audio feedback and video instructions which encourage you to achieve the perfect exercise form - thereby offering the skills of a personal trainer at your fingertips in the comfort of your home. Kaia Health is a healthcare company that combines science and technology to empower patients to treat chronic conditions effectively at home and live free of chronic pain. Kaia’s patent-pending motion tracking is set to transform the world of fitness and physiotherapy by allowing personal trainers, sports scientists and physiotherapists to define an infinite number of correct exercises. Later this year, Kaia Health will integrate the motion tracking technology into its various medical device apps including their ‘Kaia Back Pain Relief at Home’ app, a clinically-proven therapy app for nonspecific back pain, and ‘Kaia COPD Therapy’ app which helps to relieve the symptoms of Chronic Obstructive Pulmonary Disease. This best-in-class digital multimodal therapy approach is great news for patients as the technology that underpins it will help to monitor trends in the progression of a disease or condition. Kaia Back Pain Therapy and Kaia COPD both use artificial intelligence to learn about your condition and provide you with a personalized exercise program that combines physiotherapeutic, mindfulness and educational exercises for ​effective treatment at home. The first 7 days of the program are free of charge within our free trial offer. A paid "Motion Coach" subscription provides access to all contents and can be purchased for 3 months, 6 months or yearly. If you opt for the subscription, you pay the fixed price for your country which is displayed in the app. Payment will be charged to your iTunes Account at confirmation of purchase. Subscriptions will automatically renew at the end of the period, for the same price. You can turn off the auto-renewal at any time up until 24-hours before the end of the subscription period in your Account Settings. When you cancel the auto-renewal, access to the paid features will not expire immediately, you will have access until the end of the current payment period. You asked we delivered! The app has evolved from the Perfect Squat Challenge and now features a full fitness program with Motion Coach support and next-generation Body Detection technology. Just tried it out and it works really smooth. Hope they release new exercises soon! Erfordert iOS 12.0 oder neuer. Kompatibel mit iPhone 6s, iPhone 6s Plus, iPhone SE, iPhone 7, iPhone 7 Plus, iPhone 8, iPhone 8 Plus, iPhone X, iPhone XS, iPhone XS Max, iPhone XR, 12,9" iPad Pro, 12,9" iPad Pro Wi-Fi + Cellular, 9,7" iPad Pro, 9,7" iPad Pro Wi-Fi + Cellular, iPad Wi‑Fi (5. Generation), iPad Wi‑Fi + Cellular (5. Generation), 12,9" iPad Pro (2. Generation), 12,9" iPad Pro Wi‑Fi + Cellular (2. Generation), 10,5" iPad Pro, 10,5" iPad Pro Wi‑Fi + Cellular, iPad (6. Generation), iPad Wi-Fi + Cellular (6. Generation), 11" iPad Pro, 11" iPad ProWi-Fi + Cellular, 12,9" iPad Pro (3. Generation), 12,9“ iPad Pro (3. Generation) Wi-Fi + Cellular, iPad mini (5. Generation), iPad mini (5. Generation) Wi‑Fi + Cellular, iPad Air (3. Generation) und iPad Air (3. Generation) Wi‑Fi + Cellular.